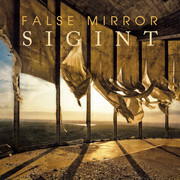 "False Mirror is a one-man project of Tobias Hornberger, focusing on Dark Ambient music and experimental soundscapes inspired by natural forces and industrial derelicts. Sound sources range from various instruments like flutes, guitars, accordion, synthesizers and some exotic and self-built ones to an extensive use of field recordings and recordings of other non-musical sounds. Many of the software tools and algorithms are programmed by Tobias himself. Tobias Hornberger is also engaged in the Musique concréte/experimental music ensemble EMU and doing soundworks for installations, etc."